In the early 1860s, Vasily Perov went to Paris. In 1865, during his stay in the capital of France, he began creating a cycle of paintings that reveal themes of the poor and loneliness. 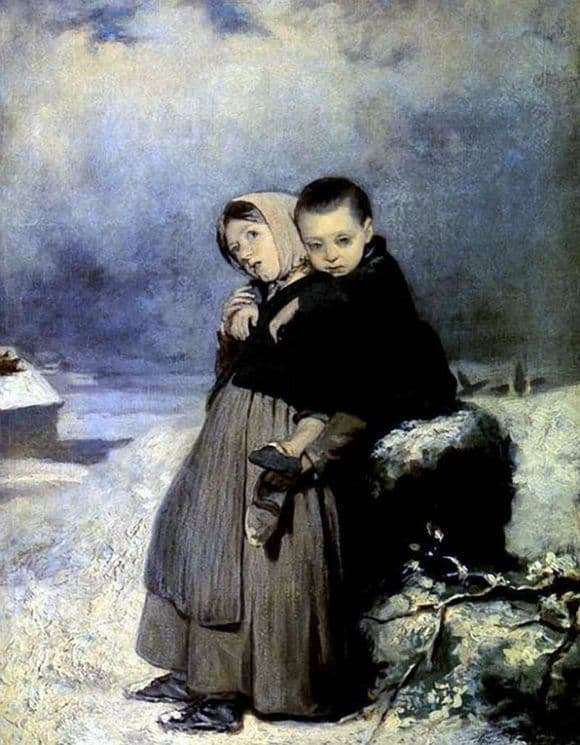 Among them is a true masterpiece of the artist “Orphans in the cemetery” of 1864. This small picture contains important themes for the rest of the artist’s work: death, grief, and children’s tears. In the picture there are young children who stand alone next to the snow-covered grave. Vasily Perov skillfully conveys the emotionally expressive component of the picture. The artist set himself the goal to depict not only specific people. But to show the audience childhood, doomed to eternal starvation and wandering. This is emphasized by pathetic clothing, bare legs, large and desperate childish eyes. Their appearance symbolizes tragedy, despair and hopelessness. Perov skillfully depicted the landscape that surrounds the children. The snowy sky looks heavy, the snow has blue-gray hues, and in the background you can see the crosses that are crooked. Work is not devoid of symbolic meaning. On the gravestone, next to which there are children, rubbed a branch, which is strange in the winter. She here symbolizes the victory of life over death. It is possible that the branch was brought to the grave by children as the only decoration. A boy and a girl stand as if they form a sculptural unity. Thanks to the skill of the artist, his tenacious gaze and experiences, the viewer feels sincere sympathy, pity for the children and a desire to help them.